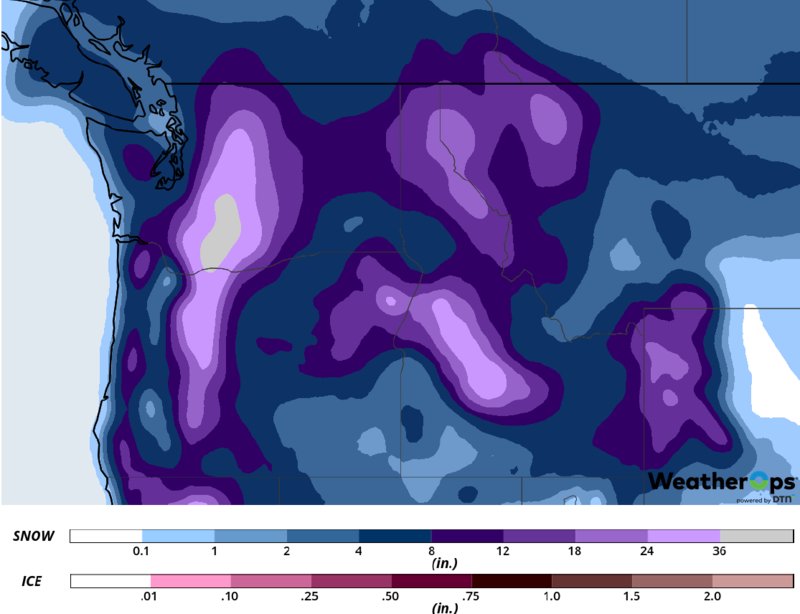 Snow is expected across the Pacific Northwest through Wednesday as a series of low pressure systems move through the region. Freezing rain is forecast through Tuesday from the Mid Atlantic into southern New England. Snow is expected for the Northern Plains and Upper Mississippi Valley through Tuesday. 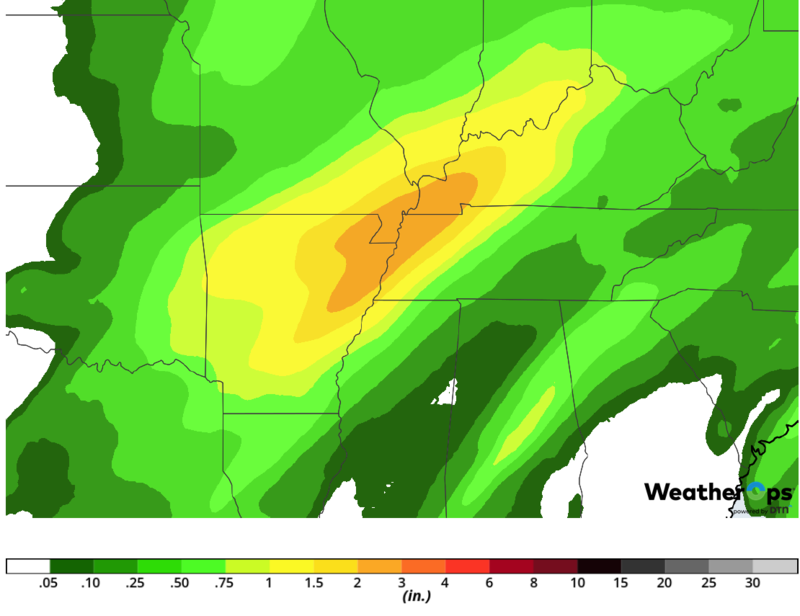 Excessive rainfall is forecast Monday from central Arkansas into the Ohio Valley. A series of low pressure areas are forecast to move into the region through Wednesday; each one will produce snow. Snow accumulations will be in the higher elevations of the Cascades and further inland. Accumulations could be in excess of 3 feet in the higher elevations. In the lower elevations, accumulations will range 3-7 inches. A developing area of low pressure and moisture moving northward will allow for wintry precipitation across the Mid Atlantic into Southern New England. Some of this could be in the form of sleet and freezing rain. Freezing rain accumulations will range 0.20-0.40 inch through tomorrow from Virginia northward into Pennsylvania and New York. The exact location of icing is dependent on the depth of cold air at the surface. As an upper level trough moves over the Plains today, an associated surface low is expected to develop over the High Plains and move eastward. 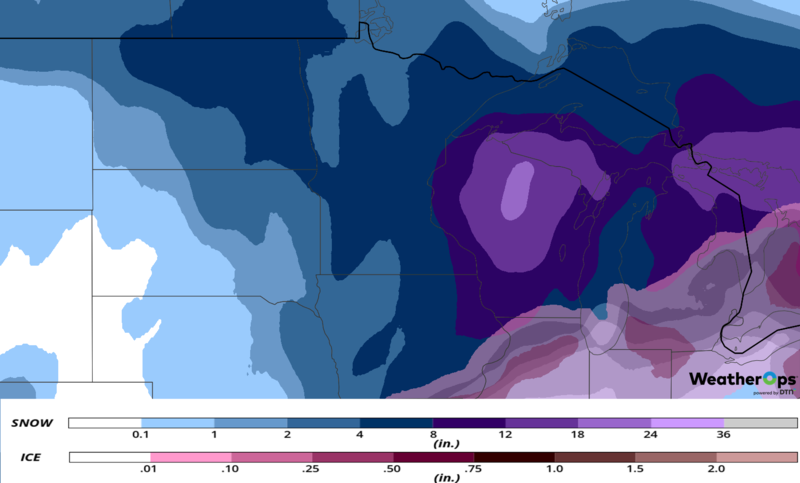 Snow is forecast from the Dakotas into Iowa. Snowfall accumulations through Tuesday will range 2-4 inches in the Dakotas and 4-7 inches across Iowa and southern Minnesota. Some freezing rain may develop across northern Missouri, southern Iowa, and northern portions of Illinois and Indiana. Ice accumulation will range 0.10-0.25 inch with locally higher amounts in excess of 0.30 inch. Wind chills could be below -10°F. An upper level trough will be moving eastward across the Plains today. The associated surface low will move eastward from the High Plains into eastern Oklahoma during the evening hours. A warm front will extend roughly eastward from the low across the Mid-Mississippi Valley into Kentucky and West Virginia. Moist air will move northward from the Gulf and with lift provided by the trough, showers and thunderstorms are expected to develop along and south of the front. Rainfall amounts will range 1-3 inches with locally higher amounts in excess of 4 inches from Arkansas into Tennessee, Kentucky, Illinois, Indiana, and Ohio. 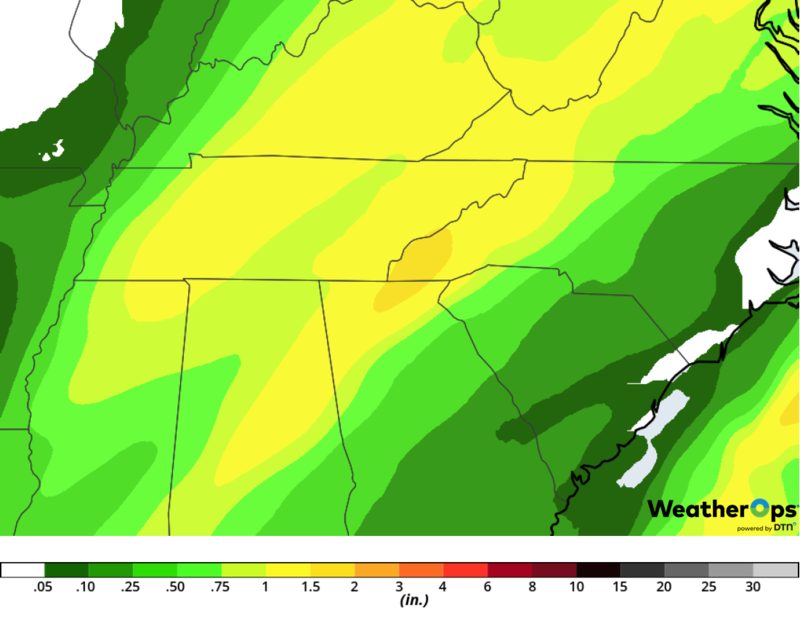 Flash flooding is likely, especially in areas that received rainfall on Sunday. The system that is bringing snow to the Northern Plains and the Upper Mississippi Valley today will move eastward on Tuesday, producing snow and freezing rain from the Great Lakes into New England. Widespread snowfall amounts of 6-8 inches are forecast along with ice in parts of northern Indiana, northern Ohio, and portions of the Mid Atlantic and New England. 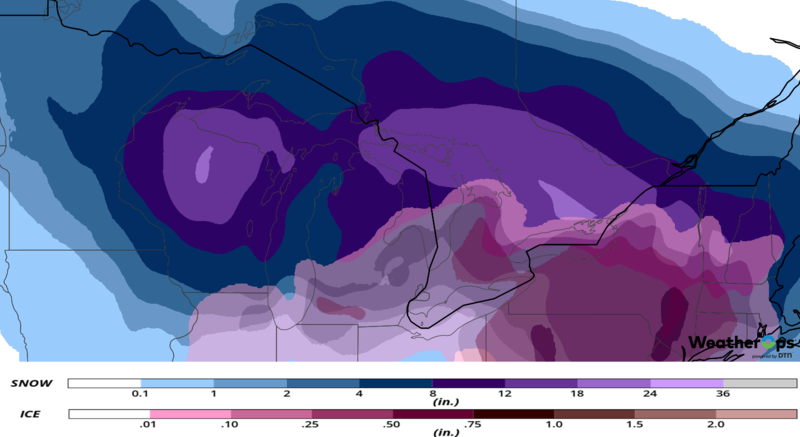 Ice accumulations may exceed 0.30 inch from southern Michigan eastward into Pennsylvania and New York. The system that is expected to produce showers and thunderstorms from Arkansas into the Ohio Valley today will continue to move eastward on Tuesday. The low will move northeastward from eastern Oklahoma toward the Great Lakes and its cold front will move eastward. While showers and thunderstorms could develop anywhere along the front, moderate to heavy rainfall is likely along the western slopes of the Appalachians from eastern Tennessee into portions of West Virginia and Virginia. Amounts of 1-2 inches with locally higher amounts in excess of 3 inches are forecast. After snow from the past weekend, the Sierra Nevadas will get a break Monday and Tuesday. 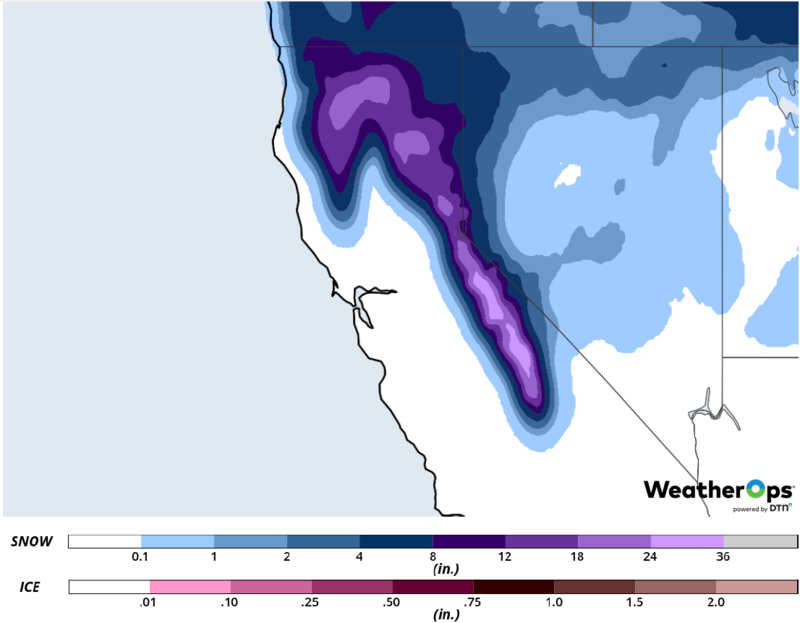 Another round of snow is expected on Wednesday as a new system moves onshore, pushing moist air upslope across the Sierras and producing another round of heavy snow. Snowfall accumulations will be near a foot. In addition, winds could exceed 50 mph, creating hazardous travel conditions. 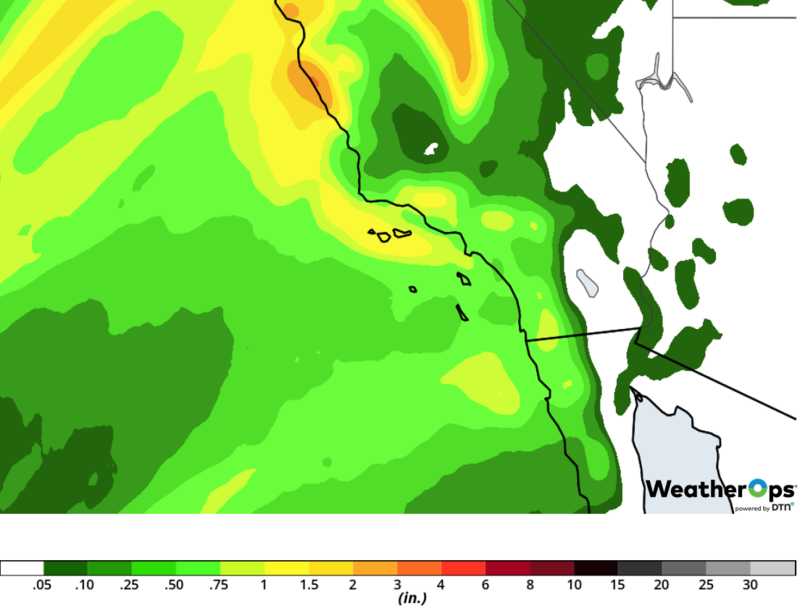 Deep Pacific moisture will be moving into California on Wednesday as southwesterly winds increase ahead of a pair of surface lows moving toward the northern California coast. 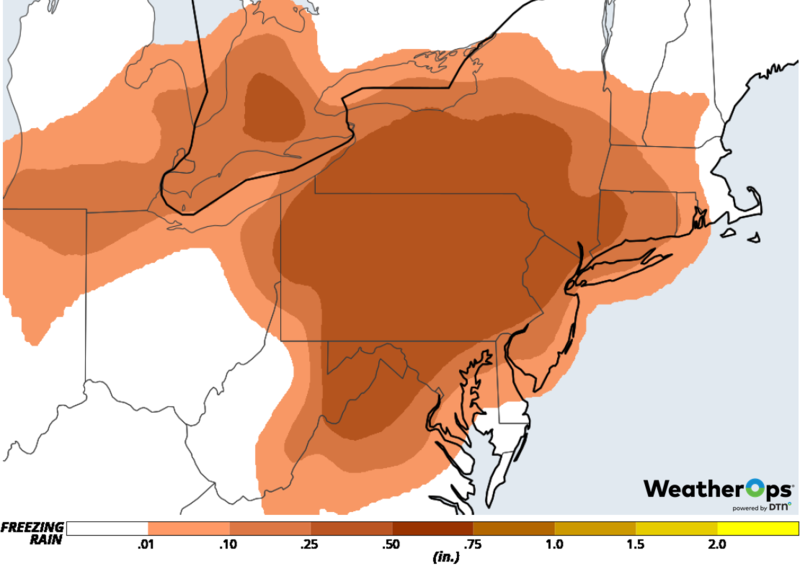 A series of upper level disturbances will move over the region as well, resulting in widespread moderate to heavy rainfall. Rainfall amounts will range 1-3 inches with locally higher amounts in excess of 4 inches. This could cause flash flooding and mudslides from burn scars. Heavy rain may persist across southern California through Friday as an area of low pressure moves across the region. Snow is forecast to develop from the Northern Plains into the Great Lakes on Thursday ahead of a cold front. On Friday, snow will extend from the Northeast into the Appalachians; this activity may continue into early Saturday. Light snow may develop Saturday across portions of the Northern Plains and Upper Midwest. Snow is forecast from the Plains into the Ohio Valley on Sunday.